Spearheading the mission of saving lives and incorporating the objective of providing prompt health services to every citizen of the state in case of emergency the government started 108 Bike Ambulance services also called First Responder Bikes (FRB) on 02nd April, 2018 which on 22nd April, 2018 achieved a milestone of successfully serving one hundred Emergencies in Shimla city. 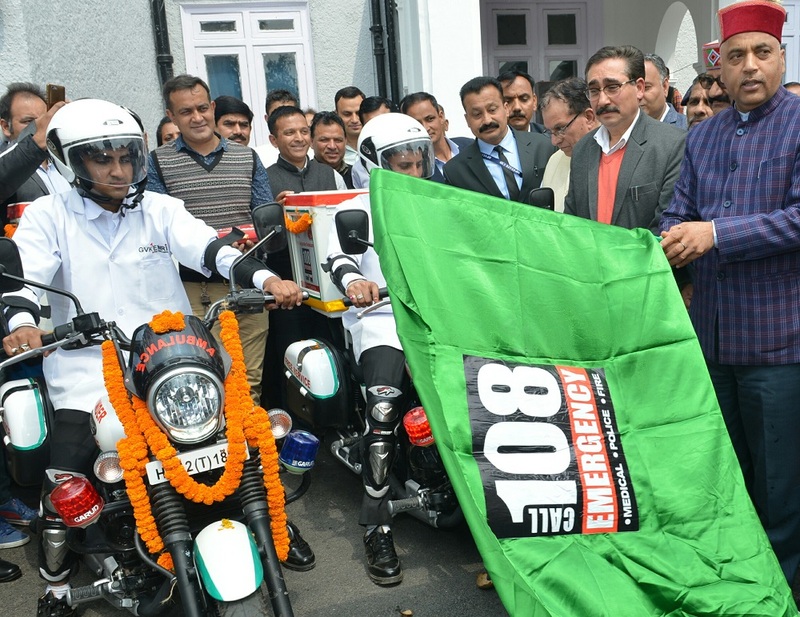 The 108 First Responder Bike Ambulance service with a fleet of 2 Bike Ambulances operated in Shimla City with base location at Ridge has achieved this milestone within a short time period of 20 days at an average of close to 5 Emergencies served daily. During this period the highest no. of cases reported were of Acute Abdomen at 24% followed by Non Vehicular Trauma at 14% and Cardiac & Fainting both at 9%. These Bikes Ambulances are equipped with primary pre hospital care facilities such as medicines, medical consumables and medical equipments along with oxygen required for stabilization of patients. The main objective of Bikes ambulances service is to gain access in areas inaccessible to four wheeler ambulances and provide primary pre hospital care to the patient. The staff deployed at the Bikes Ambulance provide first aid and initiate stabilization of the patient, in 68% of Emergencies Pre Hospital Care was provided to the patient at location and after that it was not necessary for further shifting of the patient to a hospital. Only in 32% of the patients they were shifted to the nearest hospital with the help of four wheeler ambulance providing appropriate pre hospital care for further treatment. These Bike Ambulances will aid to reduce the response time during the peak tourist season and during traffic jams, drawing an analogy from the bike ambulances operating in other states. A well placed network of Bike Ambulances has been created. As many as 9 places in Shimla have been identified for placing Bike Ambulances in the city. It can reduce the response time by close to 33 percent which would result in further positive outcomes of reduced mortality and morbidity. It is pertinent to mention that Bike Ambulance Service has been supplementing the services of 108 National Ambulance Service to ferry patients from inaccessible points to the main ambulance so that precious life could be saved. Health Minister informed that 108 NAS has a big network of 198 ambulances in the State serving the humanity in distress. Since its inception more than 10.50 lakh emergency calls have been recorded so far and giving relief to almost equal number. This service has proved life savior in critical situation especially pregnant women in labour pain. Health Minister said that owing to tough topography of the state Bike Ambulance service was introduced for quick service to persons in state of medical emergency. 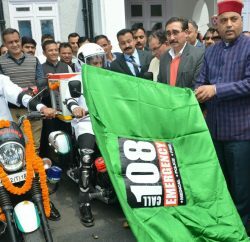 Himachal Pradesh is the first state in the entire North India to start first responder Bike service. This service can be availed by dialing 108 number. Bike Ambulances provide service at points which are inaccessible by four wheeler ambulance services. Combination of bike and main ambulance service would prove to be a strong blend in ensuring timely help to persons in medical emergencies.